Did you know that 80% of California kids receiving free/reduced-price lunch during the school year are not participating in a subsidized summer meal program? That means an estimated 2 million low-income kids may be missing out on the stability of a free, daily nutritious lunch during the summer months. 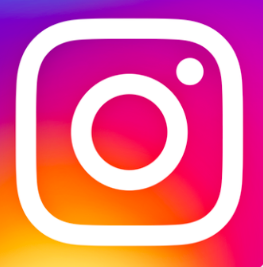 The California Summer Meal Coalition is a statewide network dedicated to fighting childhood hunger and obesity by increasing access to the USDA’s summer food programs. Please join the Coalition for its free webinar series to learn how you can play a part in stopping the summer nutrition gap and keep California’s kids healthy and ready to learn, all year long. On February 1st, State Superintendent of Public Instruction Tom Torlakson announced that applications are available for the Summer Food Service Program, a federally funded, state-administered program that serves meals to California’s low-income children. The California Food Policy Advocates, in collaboration with the California Endowment, school food service directors, and with expertise from members of the California Local School Wellness Collaborate, recently released new LCAP resources. These resources include nutrition and academic success stories with the Local Control Accountability Plan (LCAP). Additional resources are also available to help support districts in meeting their student’s nutritional needs. Access the resources, here. In 2015, more than 1.7 million of California’s most vulnerable kids fell into the summer nutrition gap. “School’s Out…Who Ate?” is an annual report published by California Food Policy Advocates to examine the reach of federal summer meal programs across the state. The report describes a summer nutrition gap that spans over 1.7 million kids across the state. That means 85 percent of children who rely on the health and academic benefits of free or reduced-price lunches during the school year miss out on similar meals during the summer. On the upside, while California’s summer meal gap is substantial and persistent, when it comes to federally funded free or reduced-price (FRP) summer lunches served, progress continues to be made. 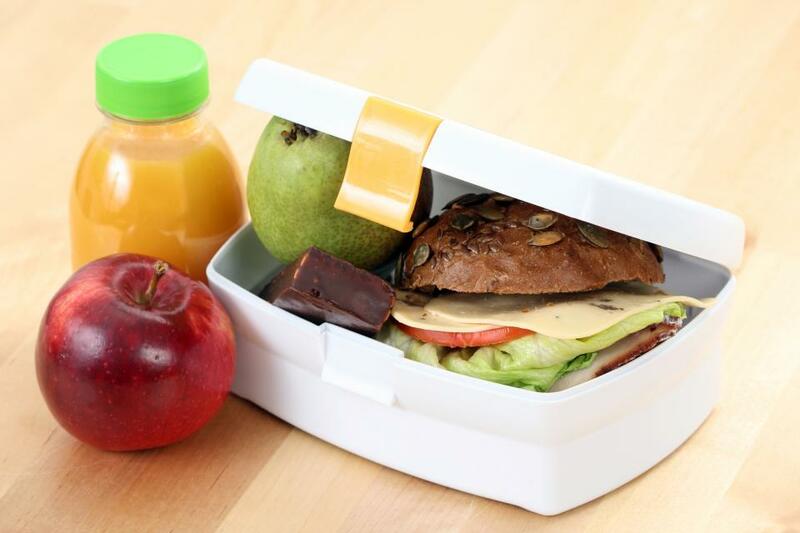 From July 2014 to July 2015, more than 130,000 additional FRP lunches were served across all summer nutritional programs for an overall increase of 2 percent. Read more here. With the recent introduction of the Summer Meals Act of 2015, more families and children will have increased access to Summer Meal Programs. Specifically, this bill proposes an eligibility test that allows organizations to participate in summer meal programs if 40% of the children in their area qualify as under served. This would streamline child nutrition programs by allowing local government agencies and non-profits to provide food to children throughout the year, eliminating administrative issues. The United States Department of Agriculture (USDA) has recently proposed a new meal pattern for the Child and Adult Care Food Program (CACFP). There is currently an opportunity for public comment concluding April 15, 2015. The proposed rule, “Child and Adult Care Food Program: Meal Pattern Revisions Related to the Healthy, Hunger-Free Kids Act of 2010,” will affect CACFP programs in Head Start, child care centers, family child care homes, after school programs, and school meal programs in school-based PreK and expanded learning time programs. . 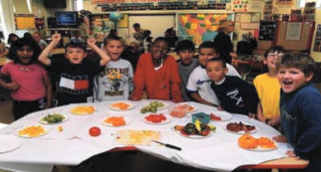 This webinar was created by the California AfterSchool Network Nutrition and Physical Activity Committee and is one in a series of “Nuts and Bolts” webinars on the Child and Adult Care Food Program (CACFP) After School Meal Program. Each brief (10 minute) webinar focuses on specific issues facing expanded learning programs implementing the CACFP After School Meal Program. Thank you to our speakers Bruno Marchesi (Healthy Behaviors Initiative), Rodney Taylor (Nutrition Services Department, Riverside Unified School District), and Doreen Hassan (YMCA of Silicon Valley). 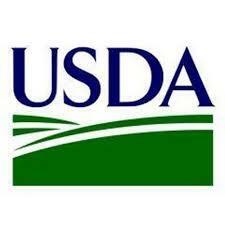 As of January 1, 2014, after school programs have the option to serve a snack, a meal, or both. All snacks provided to students in the CDE’s After School Education and Safety (ASES) programs or the federally funded 21st Century Community Learning Centers (21st CCLC) programs must meet, at a minimum, the California nutrition standards identified below. 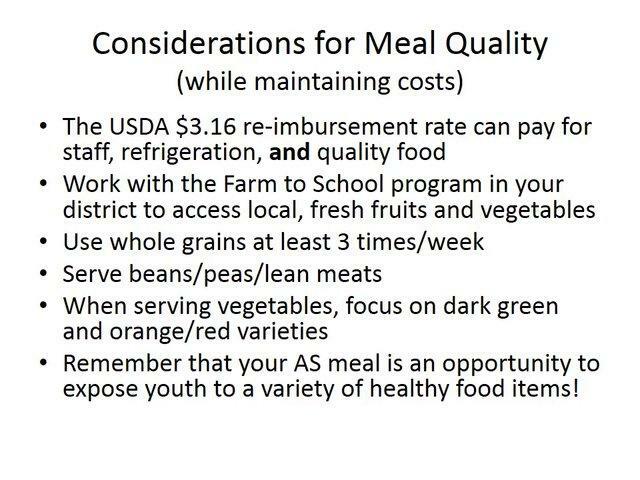 If snacks are provided through one of the federally reimbursable meal programs, the food must meet both the federal requirements and the California nutrition standards. This brief (10-minute) presentation of the California AfterSchool Network Nutrition and Physical Activity features Arnell Hinkle (Canfit) Deborah Tamannaie (CDE Nutrition Services Division) and Michelle Drake (Elk Grove Unified School District). 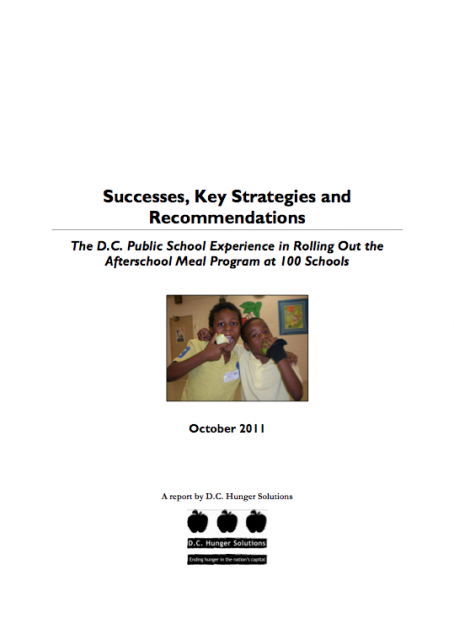 The presentation outlines the requirements and benefits of the After School Meal Program, how to get started with the After School Meal Program, and promising practices including sample hot and cold menu ideas and schedules. State Schools Chief Tom Torlakson is encouraging schools, camps, Indian tribal governments, private nonprofit agencies, and municipal, state, county, and local government offices to apply to become summer food service program sponsors. Sponsors will obtain food from another SFSP sponsor, public or commercial food vendor, or school food service department and provide activities to promote the food program, inviting families to bring their children to the site to be fed nutritious food without any income verification required. This 10-minute video is the first of a series of future videos on the nuts and bolts of the Child and Adult Care Food Program, After School Meal or Supper program. 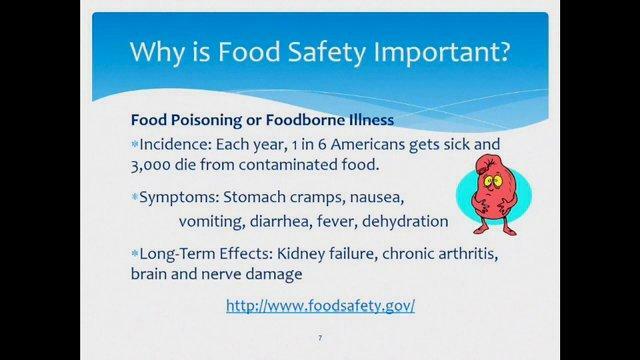 The video is hosted by Kathy B. Lewis, Co-chair of the Nutrition and Physical Activity committee of the California AfterSchool Network, and Laurie Pennings, Manager of the CACFP Unit at the Nutrition Services Division of the California Department of Education. 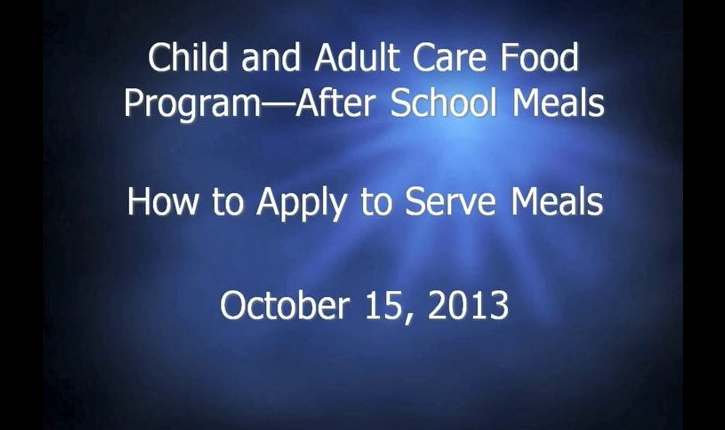 The video presentation focuses on how to apply for the CACFP After Meal Program and the different application options and resources available. 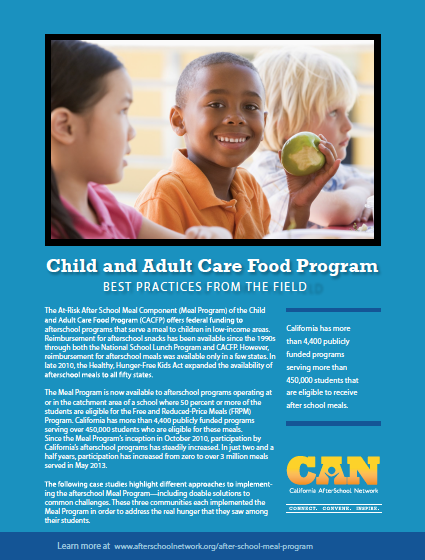 Read best practices from programs that are serving meals in their after school programs around the state including Oakland Unified School District, South Bay Union School District, and the YMCA of Silicon Valley. Moving from Afterschool Snack to a Meal– It’s easier than you think! Afterschool programs serve a snack in order to keep children focused and engaged throughout the afternoon. Yet, for many children a snack is not enough. Children eat lunch hours before the afterschool program, sometimes as early as 10:30 in the morning, and need more than a small snack to make it through the afternoon. In addition, many families are struggling financially, and programs that provide a nutritious meal after school make it easier for parents to make ends meet and keep children from being hungry. 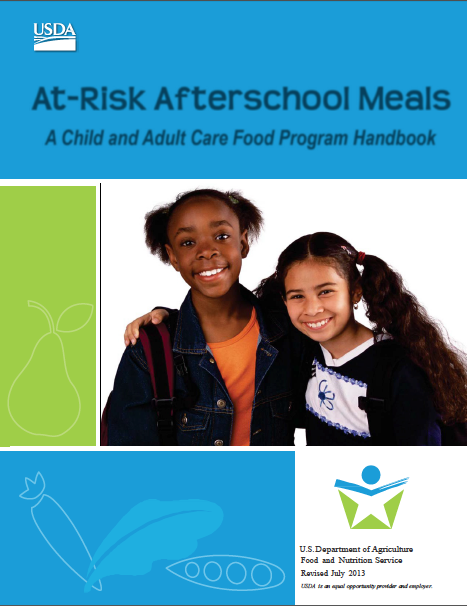 The new edition of the CACFP At-Risk Afterschool Meals handbook is provided for your convenience.